A high-quality pasta is key to the success of this dish, which makes a great starter or light lunch. By the time it is ready to eat, the pasta should retain its essential al dente bite. First, make the tomato sauce. In a solid pan, stew the garlic in the butter until pale golden. Add the tomatoes, passata and a small pinch of salt. Simmer for 20 minutes until reduced by about two thirds; it should be very thick. Lightly butter a 25cm x 15cm x 5cm baking dish, then sieve the sauce into it, spreading it with a spoon. Set aside. For the bechamel sauce, heat the milk with the bay leaf, nutmeg and a little salt. Simmer for 3–4 minutes, then turn off the heat, cover and leave to sit for 10 minutes. Meanwhile, preheat the oven to 180°C, gas mark 4. To make the filling, fry the onion and garlic in the butter until soft, then add the mushrooms. Season and stew for 10 minutes. Add the herbs, lemon juice and vermouth, turn up the heat and cook fast until dry. Leave to cool. To finish the bechamel sauce, melt the butter in a clean pan and stir in the flour; cook for 1–2 minutes. Add the infused milk (minus the bay leaf), whisking until smooth. On the lowest heat, stir for 10 minutes until it comes to the boil and thickens. Season, cover and keep warm. Blend the mushroom mixture in a food processor and fill the tubes – using a piping bag is the most efficient method. 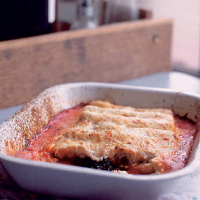 Place the cannelloni in the dish, pushing the tubes into the tomato sauce. Blanket with the bechamel sauce and sprinkle the surface with Parmesan. Bake for 50–60 minutes, until golden and bubbling. The Corker recommends- Succulent cannelloni respond well to the deft tannins of a classic Tuscan red.